I love going on a trip, whether it is overnight or for an entire week. It is so refreshing to just get away from the every day routine. However, with the joys of vacation also come the realities of laundry and unpacking all the bags after returning. Having just returned from a trip over fall break with my family, I am well acquainted with unpacking the suitcases. To successfully empty the bag, you must look at each item and determine where it needs to go. The very same idea is utilized when “unpacking” a verse of scripture. To really get the most out of the passage, you can’t simply read it once and move on. Just like my suitcase from vacation, it is necessary to examine the contents. Today, I will spare you the task of unpacking my families’ bags, but I would like to do some unpacking of Isaiah 49:23b, the key verse for week 1 of A Confident Heart Online Bible Study. Then you will know that I am the Lord. 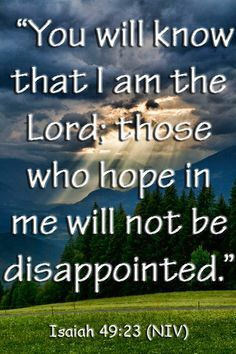 Those who hope in me will not be disappointed (NIV). As I read through this verse over the course of the week, three words really jumped off the page at me – know, hope and disappointed. My wonderful husband gave me a Hebrew-Greek key word study Bible for our anniversary, so I was able to go back to the original Hebrew words and dig deeper into the meaning of this scripture. Know – comes from the Hebrew word Yada, which is one of the most important Hebrew roots in the Old Testament. It means to discern, be familiar with, also signifies a person’s relationship with God. Hope – comes from the Hebrew word Miqweh, meaning confidence, hope and expectation. Disappointed – comes from the Hebrew word Bos. It often occurs in the context of humiliation, disgrace and shattered emotions. There is usually a connotation of guilt. Armed with these definitions, this verse really comes alive to me. In order for me to know that He is the Lord, I must be familiar with Him. I have to have a personal relationship with God, which requires time and effort on my part. However, it does not stop with a simple relationship. God follows it up with a promise. Whoever puts her trust or confidence in God will not be disgraced and full of guilt. It is no accident that Isaiah 49:23b was chosen for the first key verse. This scripture needs to be the foundation, not only for this study, but also for our lives. Everything else needs to build upon this. You see our confidence needs to be in Christ alone and not bogged down by guilt and shame. If we are in Christ, God does not see our past because the blood of Christ has washed us white as snow. Everything in our lives needs to run through the filter of how God sees us and what He thinks of us. If we rely upon ourselves, we are setting ourselves up for disappointment. God, on the other hand, promises that those who keep their confidence in Him will not be disappointed. What about you, where is your hope and confidence today? Thanks Jamie. last paragraph is something i want to remember. Thank you for these words, I can so relate to the unpacking and what a good metaphor! I realized I had not yet verse mapped this verse and this has inspired me to do so. Thank you Jamie, I love the metaphor of the unpacking of the suitcase after a trip! Boy, can I relate to that. I am going to go verse map Isaiah 49:23 right now. I especially like the roots of the word hope. The CONFIDENT expectation is different than the meaning of the word in our society today. Loved this, really spoke to my heart. Thank you for writing this! As we filter everything through Him and rely on Him, He does build our hope! I love this whole verse mapping, unpacking too. It’s very helpful to dig deeper into the original meaning of the words. To know and love God is the reason why God created us! Then, we are to share His love. Thank you for sharing this insightful post! Great post! Thank you for unpacking Is.49:23. You made this verse come alive through your thoughtful study. Be Blessed! Wonderful insight to this KEY VERSE. I wanted to remember this so I copied it in my journal. Jaime thank you for your insight. I like the comparison of unpacking from vacation. It was very ingenious. Thank you. WOW!!! ::standing and applauding:: That was incredible!!! Thank you for sharing your thoughts on this verse! I especially loved the last paragraph! For so long I have been trying to do things myself and not allowing God to help or guide me. This paragraph touched my heart and helps me to see that all of my disappointments were not a result of God not helping me but of me trying to do it myself. Thank you, thank you, thank you!!! You have REALLY unpacked this verse with your hebrew definitions. wow. I am especially moved by intent behind “disappoint”. Thanks for doing the hebrew homework and allowing the lord to speak to me. Yes! I was especially moved by the disappoint part also! “It often occurs in the context of humiliation, disgrace and shattered emotions. There is usually a connotation of guilt.” This is my HUGE shadow of doubt lately – that I will be disgraced, humiliated, or my emotions will be shattered by my situation. I live in constant fear of this – I try to hold on so tight in order to avoid this. But God says this is not necessary – all my fears and stress are not necessary – All I have to do is trust in him – its that simple. Wow! What a feeling of peace. Thank you Jamy!! This is exactly what I needed to read! Thank you Lord that you are always faithful, even in my times of doubt and weakness. Thank you for the message. The verse touched me deeply. I know now I have to put God first always ask for his mercy, grace, and guidance. I’ve started reading ch. 2 of confident heart & through out my day I asked the Lord to give me confidence.